The Day they let the Wind in. Great for trucks and cars. Not so good for people. What would we do today? 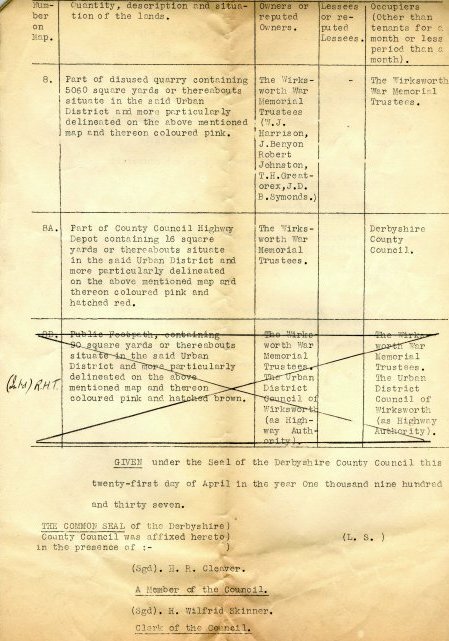 Seventy years ago, Wirksworth Council decided to build a new road into the heart of the town, and name it after the chairman of the council - Harrison Drive. What was there before the road? Why was the road built? When was the road built? A cosy place for holding big meetings, surrounded by high buildings like a walled garden. Then the New Road let the North wind and the traffic in. 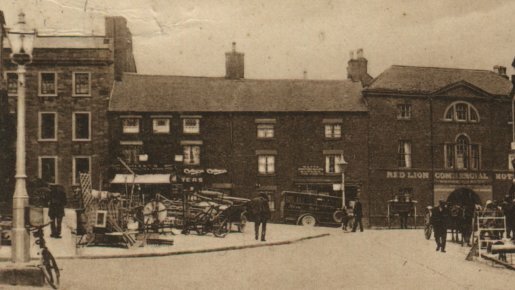 The buildings that vanished - Doxey's tearooms and Watts' taxis - are on the far right of the photos. Designed to help the quarry trucks get through Wirksworth. The big house with 14 windows, No 15 Market Place (dating from c1740), is called Symonds House after Christopher Symonds, a solicitor from Lincolnshire. Right of that are Nellie Doxey's tea-rooms and newsagent. Right again, a charabanc is parked in front of Watt's wireless dealer and taxi firm. Extreme right, The Red Lion is an old coaching and posting inn rebuilt about 1770, but may well date back to medieval times. The agricultural equipment on the pavement belonged to Marsden the Hardware. The market, dating from 1306, was held in the area facing where the road now runs and is known as the Old Market Place. 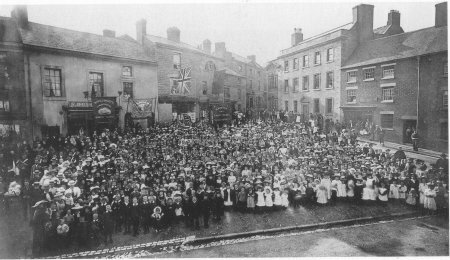 This area was almost halved in size by the building of the new road, and the market was displaced to around the corner at the foot of West End, where it is held today. 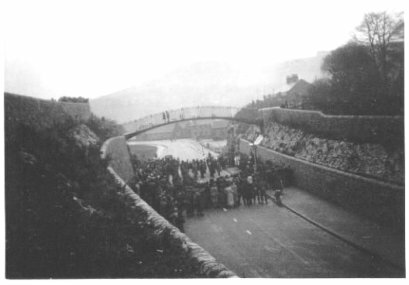 "Before the New Road (Harrison Drive) was constructed, the entrance to the road was occupied by two shops. The first was a small sweet shop which also sold biscuits and tried at a later date to branch out as a tea shop. This failed because both Miss Doxey and her brother William were eccentrics. The other shop stood empty for some time and was then taken as a second-hand furniture shop by some people from Manchester called Watts. The sons later started a motor and taxi business." "The ghost of a coachman is said to haunt the [Red Lion] premises. He was attempting to manoeuvre his coach through the archway, when the horses suddenly took fright and dashed forward. Unable to move his head in time he was decapitated. Ever since then the dark figure of a headless man has haunted the Red Lion." Dennis Eardley - Discover Derbyshire. "In early days [the Red Lion] was a noted coaching inn and has extensive stabling up the yard. At the top of the yard was the bowling green which was one of Wirksworth's "better class" affairs. Alas this was destroyed when the new road cut straight through - and so Wirksworth lost another amenity". "As lead mining declined, the limestone quarries provided work for the people who lived in the area. 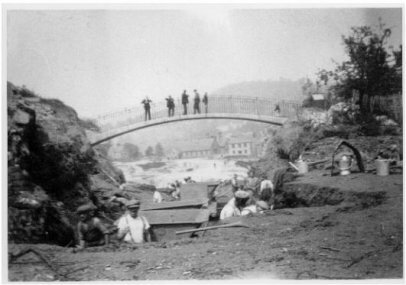 The arrival of the railway in Wirksworth, in 1867, which linked the town with Derby and the rapidly expanding railway network beyond, opened the way for the easy distribution of limestone which was in great demand. The situation was improved still further twelve years later when a railway tunnel was built below the town centre linking Dale Quarry, known locally as the "Big Hole", with the station. 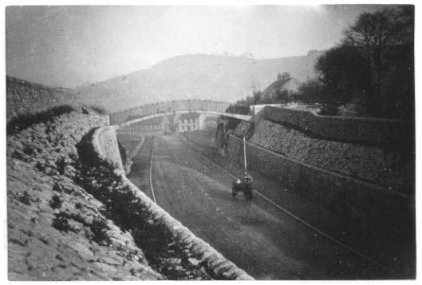 This was a big improvement in transportation as previously the stone had to be moved from the quarry by horse drawn vehicle down the Dale and through the centre of the town centre to the railway. Arched openings in the quarry face, which acted as ventilation shafts for the railway, can still be seen in the garden of a house on the Dale." "The great upheaval came in 1925-26 with the re-opening of Dale Quarry, when mechanisation was introduced and a stone crusher installed in a hole between 200 and 300 feet deep. Inevitably the whole of this densely populated area declined and the town was badly affected by the dust, dirt and noise. Many of the people who could afford to do so reluctantly left, along with business and commerce. Buildings fell into disrepair, frequently being left empty to decay, and what had been one of Derbyshire's most important towns was left blighted with the residents who remained despairing that improvements would ever take place. 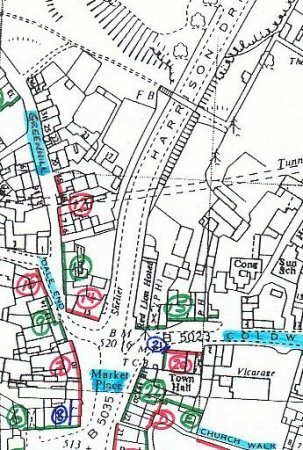 The seriousness of the situation was recognised by the West Derbyshire District Council in 1978 when a large area in the centre of the town including part of the market place, was declared a General Improvement Area." "ARTHUR HARWOOD - It was Arthur HARWOOD the quarry owner who had the tunnel under Wirksworth built. Unfortunately one of the consequences of the expansion that followed was that his house and garden fell into the quarry!" 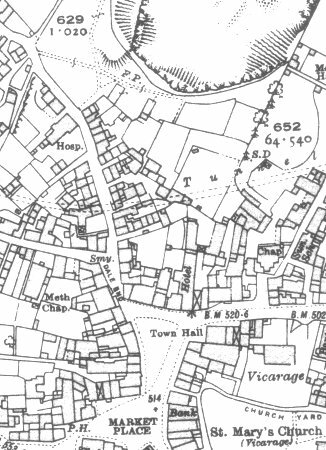 BEFORE: Wirksworth centre in 1922. The tunnel linked Dale Quarry and the railway station. AFTER: Wirksworth centre in 1957. The footbridge maintained right-of-way for the old footpath. 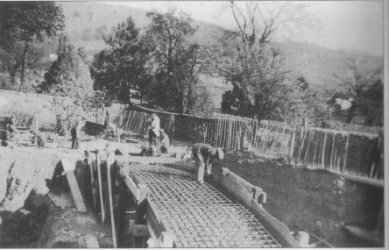 The New Road was built to ease the flow of quarry traffic through the town. Just North of Wirksworth were several large quarries: Baileycroft, Stonecroft and Middlepeak. To get South of the town, the trucks carrying limestone had to navigate two narrow old roads, North End and Coldwell street. 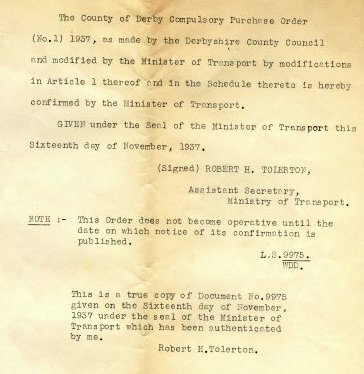 The New Road acted as a bypass, enabling quarry trucks to get direct access to St John Street and then head South towards Derby. Working on the footbridge over the new road. Workmen digging out the new road by pick and shovel. The official opening ceremony of the new road. Beneath the bridge on the right was the War Memorial. The first horse and cart to travel down the road. 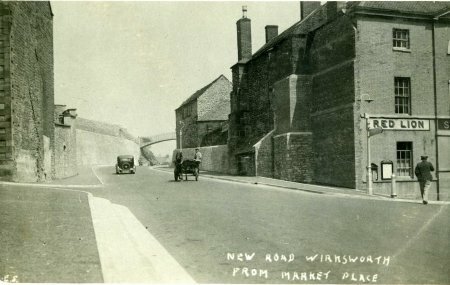 About 1940, view North from Market Place to the footbridge. The New Road points almost due North, and lets cold winter winds into the heart of the town, like a wind tunnel. The cosy Old Market Place, surrounded by high buildings like a walled garden, had to be moved South to its present position. 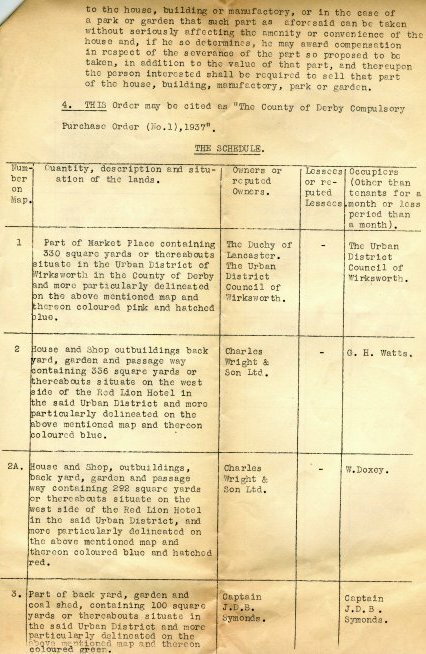 Quarry traffic became intolerable, and threatened to shake many old houses to pieces. Today, quarry trucks have been replaced by private cars, but walking the narrow pavements is still risky and not as pleasant as before 1938. Harrison Drive was named after William John Harrison, Chairman of Wirksworth Urban District Council in the 1930s. He was a joiner born in Wirksworth in 1863 and married Sarah Jane Gamble in 1886. William was eldest son of James Harrison and Mahala Buckley, who married in Wirksworth 1862. James was born in Borrowash and moved to Steeple Grange just before marriage, working as a staionary engine driver. He moved to Derby around 1870 then back to Bolehill in 1875. 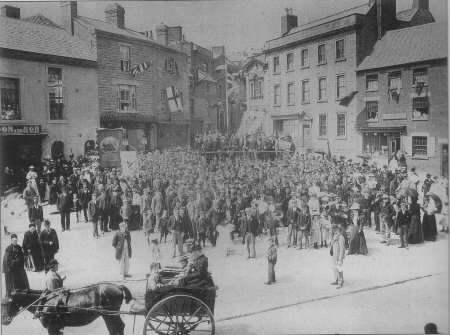 William's son Norman Harrison was a Labour Councillor on Wirksworth U.D.C. and also a Deacon at Middleton Congregational Church. As you rightly state, Harrison Drive was built to replace the only other route through Wirksworth - Cromford which was North End a narrow road built only for the days of coach and horse and not for the motor vehicle or the heavier transport of the 1930s - 40s which were lorries plying between the quarries and Wirksworth Railway Station.. The Harrison family are dare I say it, of my allied kin.. William John Harrison was Chairman of Wirksworth U.D.C. when my father Harry Sprake Flint was a Councillor ..W.J.Harrison's son Norman Harrison married Lillian Petts daughter of John James Petts of Middleton Monumental Mason with his brother Bertram Petts Bertram Petts's Grandson today carries on the family business..
1.William John Harrison born 1863 married Sarah Jane Gamble daughter of William Gamble Cordwainer / Shoe Maker. I believe his shop was where today Westons Electrical Retail outlet is (top shop one time owned in my youth by Ray Buxton of Cromford Boot and Shoe Retailer Ian Buxton noted Derbyshire Cricketer is his son). 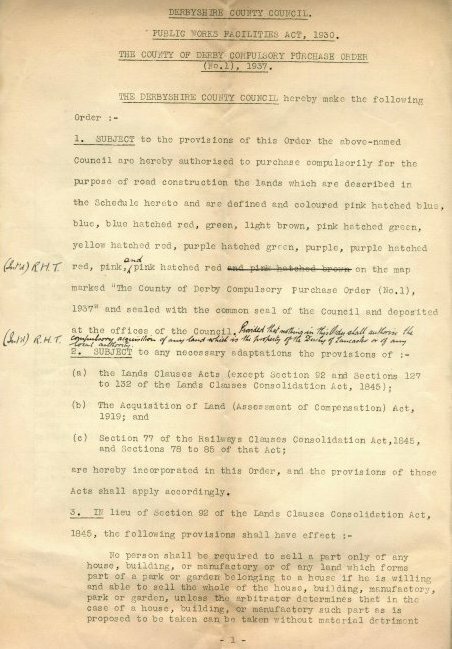 W.J.Harrison was Chairman of Wirksworth Urban District Council when the new road driven through Baileycroft Quarry in the 1930s was built to bye pass North End ..the road named after him. 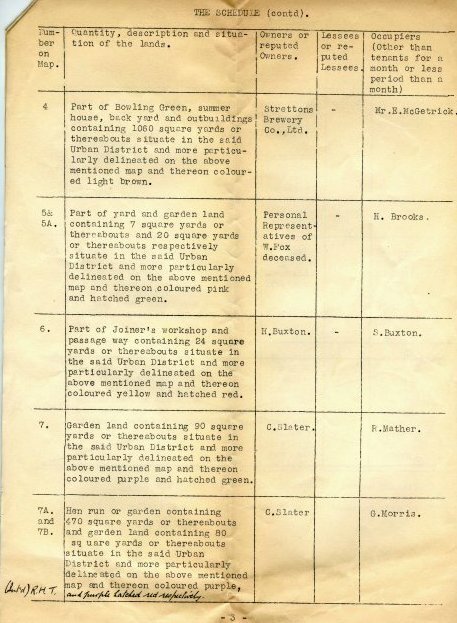 3.Norman Harrison born 1901 married Lillian Petts daughter of John James and Lydia Petts nee Brookes. John James Petts a Monumental Mason of Middleton.. Lydia's sister Ellen married Thomas Flint of my kin, Thomas son of Joseph and Mary Anne Flint nee Brookes (Joseph Flint played Cricket for Derbyshire 1870s see Roy Pierce book re Wirksworth Cricket Club).. Thomas and Ellen son Joseph Flint was my Landlord 1970s when my wife and I lived in his house on Cromford Road. Joseph's wife was related to both Harrisons and Benyons.. His sister Doris Flint married Roger Hanson Verger at St Mary the Virgin Church Wirksworth.. 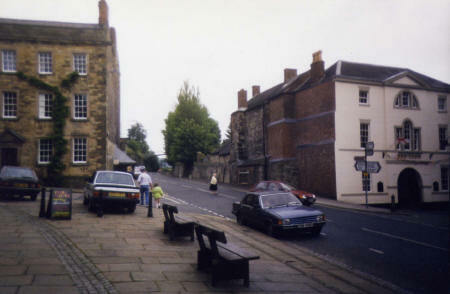 When I attended school at Wirksworth in the 1950s, I had my dinner with the Hansons on St Mary's Gate (Vergers House). [written about 1971. Hubert Harrison was born 1888. Anthony Maskrey ("Rev Tant"), also Harry Gell, of Hopton Hall. Plevna and decorated by the Turkish Govt for his work there.